Home / Unlabelled / THIS IS THE STORY OF BARA'AH - A 10 YEAR OLD GIRL DIAGNOSED WITH CANCER. 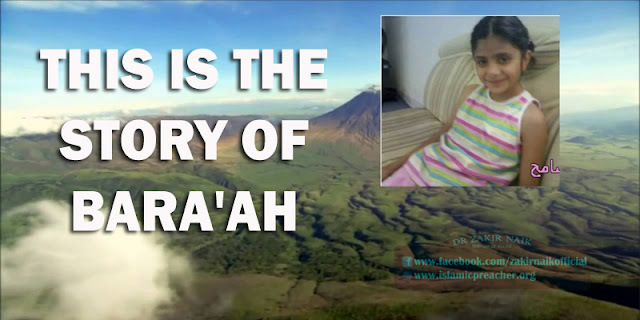 THIS IS THE STORY OF BARA'AH - A 10 YEAR OLD GIRL DIAGNOSED WITH CANCER. Bara'ah is a 10 year old who finished memorizing the whole Qur'an with Tajweed. Her parents were doctors who moved to Saudi Arabia in search of better life. Bara'ah was very intelligent. Her teacher used to tell her that she should be in middle school not primary school. Her family was small and committed to Islam and its teachings. One day, her mother began experiencing severe abdominal pain. After going to the hospital and diagnostics tests and imaging performed, it was discovered that she had cancer, but in its late stages. The mother thought she should tell her daughter, especially if she wakes up one day and didn't find her mother beside her. Being at the young tender age of 10, her mother told her: "Bara`ah, I will go to paradise ahead of you, but I want you to read the Quran you memorized every day since it will protect you in this life." The little girl didn't really understand what her mother was trying to tell her, but she began feeling the change in her mother's status. Soon, her mother was was transferred to stay in the hospital on a permanent basis. Bara'ah used to come to the hospital after school and recite the Quran for her mother until the evening when her father would take her home. One day the hospital called the husband and informed him that the his wife's condition had deteriorated and that it would be advisable to come to the hospital immediately. The father picked up Bara`ah from school and headed to the hospital. When they arrived, he asked her to stay in the car so he could first see what the condition of his wife was. The father got out of the car with tears filled in his eyes. While crossing the road to enter the hospital, he was hit by a speeding car and died in front of his daughter who came crying to her father. The tragedy of Bar`ah is not over yet. The news of her father's death was hidden from the mother. Her condition steadily worsened, and 5 days later, she passed away leaving Bar`ah alone without her parents. Her parents' friends decided to find her relatives in Egypt so that they could take care of her. Soon thereafter, Bara`ah began having severe pain, similar to what her mother experienced. At the hospital, she too was diagnosed with cancer. At the surprise of everyone, she said, "Alhamdulillah, now I will meet my parents." All of the family friends were shocked at her response. This little girl, being faced with calamity after calamity, yet she remained patient and satisfied with what Allah ordained for her! The news of Bara'ah and her story spread. One Saudi heard of her story and decided to take care of her. He sent her to the UK to receive the appropriate treatment for her condition. In the UK, her condition worsened and cancer spread throughout her body with metastasis in multiple organs. The doctors had to amputate her legs, yet she still remained patient. Soon, cancer spread to her brain the doctors had to do brain surgery. Bara'ah went into a full coma. Before she went into a coma, one of the Islamic channels (Al-Hafiz - The protector) got in contact with this little girl and asked her to recite the Qur'an. This video is of her beautiful recitation of Surah Ar Rahman.